Following hot on the heels of the US Navy’s first successful tests of their autonomous warship, the Sea Hunter, during the three day Annual Navy Technology Exercise (ANTX) that took place last month in Rhode Island’s Narragansett Bay, Lockheed Martin achieved a world first. It used an unmanned submersible to launch an Unmanned Aerial Vehicle (UAV), while an unmanned surface vehicle provided surface reconnaissance and surveillance. All the systems were unarmed. The exercise began with Ocean Aero’s Submaran surface vehicle – which looks like the equivalent of a surf board with a comms tower on it – relaying instructions from a local ground control station to Lockheed’s Marlin MK2 autonomous underwater vehicle using underwater acoustic communications. 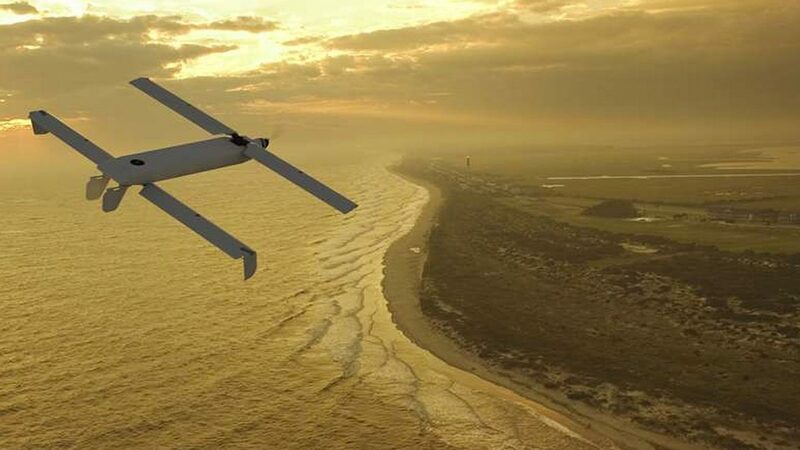 Once Marlin received those instructions it then launched a canister that contained the company’s fixed-wing Vector Hawk Suas UAV, with its wings folded back. When the canister reached the surface it opened up, the UAV unfolded its wings, took off and followed a predetermined flight path. “This effort marks a milestone in showing that an unmanned aircraft, surface vessel and undersea vehicle can communicate and complete a mission cooperatively and completely autonomously,” said Kevin Schlosser, chief architect of Lockheed’s Unmanned Systems Technology Division. Propelled by either an electric thruster or a retractable wing-sail, the 4m Submaran is equipped with solar panels that allow it to remain operational for months at a time and it can be outfitted with a variety of sensors for different applications – and is even capable of submerging beneath the surface. Meanwhile the 3m battery powered Marlin can descend to up to 305 m, cruising for up to 24 hours and managing a maximum payload of 113 kg. The Vector Hawk, meanwhile, can remain airborne for over 70 minutes on one charge of its battery pack, and has a line of sight range of up to 9 miles. While to many this might look like a fairly mundane, low level test it represents the next generation of warfare. Lockheed were in fact testing what the military call a “Kill Chain” – that’s the process by which a commander – wherever they are – issues an order and eventually, at the end of the kill chain a soldier, or in this case an asset completes it and takes out a target. This test proves that unmanned warfare is possible and the systems will only improve over time. Today we’re sharing news about a 3m submarine, tomorrow it will be a 300m nuclear submarine – and the same goes for the Submaran and the drone.